This Product is a Saltwater Boaters Dream! After 40 years of salt water boat ownership, I have finally found the cure, for the most part, for the dreaded spring prep work before the launch ie: annual bottom painting (Ugh!). In 2013 when I pulled my Mako 264 center console out of the Eel River in East Falmouth MA, the bottom paint had peeled off in sheets (multiple coatings). Now I really dreaded the springtime (in October!). I had the entire bottom bead blasted clean, sanded the areas where multiple layers of barnacles had grown. I bought ePaint’s primer epoxy and applied 2 coats. Then applied 2 coats of ZO Antifouling bottom paint. The bottom of the boat looked newer than the topsides! Four years (seasons) later and in dark briny warm Eel River, I have but a few barnacles this season (only) and only around the bronze thru hulls, trim tabs and outboards. Previously I had used Petitt’s best ablative, every season, and the bottom would be gross. After 4 years of use after only having to paint it the 1st year, I saved enough money to buy a new aluminum tandem axle trailer for my Mako! (for the past 15+ years I have always paid people to do the annual bottom painting! And always well over $1,000 per year . 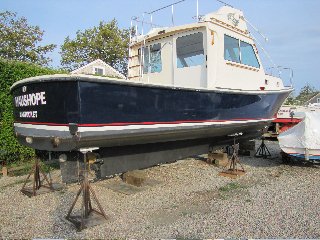 . .) All I need is enough of your paint to touch up the waterline so I look good trailering over to Sandwich Harbor. Your paint is the only paint I will ever use again. 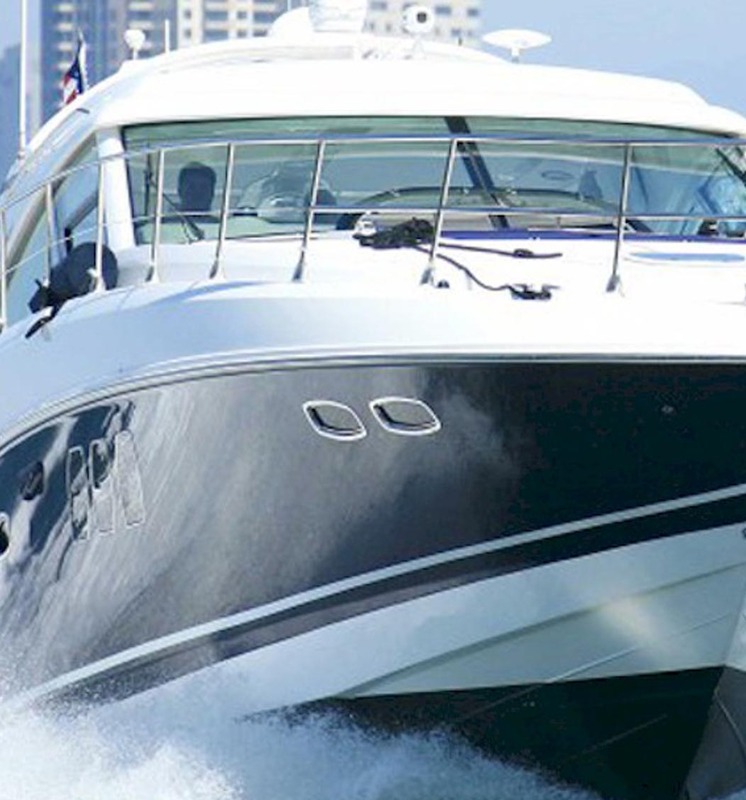 The Valkyrie is a well-recognized Sport yacht in Southern California. Captain Tom and Anita Petersen are well known around the marine world in yacht sales, training, charters and just having fun on the water. Tom has been the Commodore of 2 Yacht Clubs and has planned and initiated hundreds of outings for boaters. Would it last? Valkyrie regularly travels at 30kts which could peel off cheap ablative paint quickly, especially since Valkyrie is run several times a week. Doing some research, we found that EPaint had a non-copper paint that was used by coast guard fast boats. Ventura Harbor Boatyard arranged for Valkyrie to be painted with SN-1 HP. That process was late Summer of 2012. Bottom cleaning has been performed every 2 months which is less than recommended (ideally monthly in the Summer). 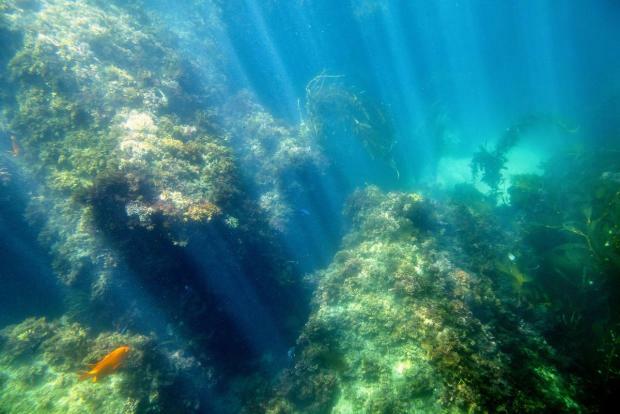 Late Fall of 2015, the bottom cleaning service (Green Clean Dive Service in Channel Islands Harbor) announced that on a scale of 1-10, the bottom paint was still effective at around 6 and that sometime soon we should start planning to repaint. March 2016, now 3.5 years after first applying the Epaint, we are finally planning to haul Valkyrie out for a repaint. Copper Paint is still allowed, but continues to be discussed in regards to banning its use. 3.5 years for ANY paint to be effective is fantastic! This is a testament to great quality paint and regardless if copper paint is still available, a non-copper paint alternative for roughly the same price, is a no-brainer! 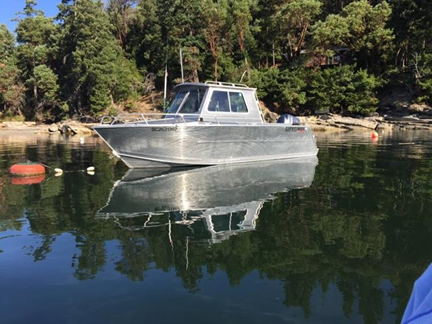 My aluminum 24ft Crew Boat is 5 years old and has started out its life here in British Columbia with Epaint on its first launch. I have had the boat manufacture apply a new application 2 years ago, and it still looks quite good without any barnacles etc. Your products are very new up here in BC, but we have had good success, 2 seasons between applications. 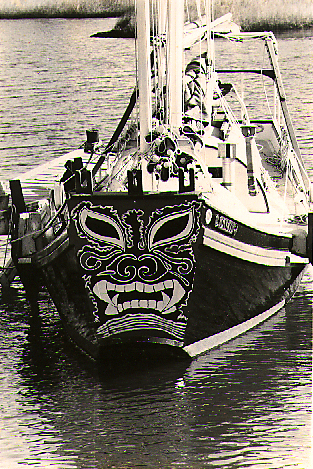 We have a 1979 Bruno Stillman that we use as our Race Committee Boat both in the inner harbor and within Nantucket Sound. This year we removed all of the old bottom paint, prepped, primed and applied your Epaint bottom paint and were amazed at the results! We picked up 2 knots of speed, bettered our fuel economy and just look at the attached pictures that show her pristine condition after removing her for the winter. Of course these positives came as a surprise to us knowing that the reason for switching to your bottom paint was purely to avoid how old bottom paint impacts our fragile environment. I applied three coats of the ePaint ECOMINDER to Cygnus, my 26′ Phil Rhodes designed O’Day Outlaw sloop in the spring of 2009, following the directions for application closely. I kept the boat in the water for two seasons. The paint worked great for the first season. Although the paint was not intended to last more than one season, I have had minimal fouling this second year as well. With the ocean subjected to the threat of pollution from all angles, I appreciate that ePaint is making it possible for those of us who gain so much enjoyment from the water to take action so that we can improve the well-being of the sea for generations to come. Two things. First, Sailors for the Sea awarded us Gold for all of the One Design and Dry Sailed regattas this past Saturday. This was made possible by your generosity in providing paint to NCS [Nantucket Community Sailing] for all their support Boats and their J 105s etc, and by Nantucket Yacht Club’s initiative to paint their large signal boat and various support boats with your products. 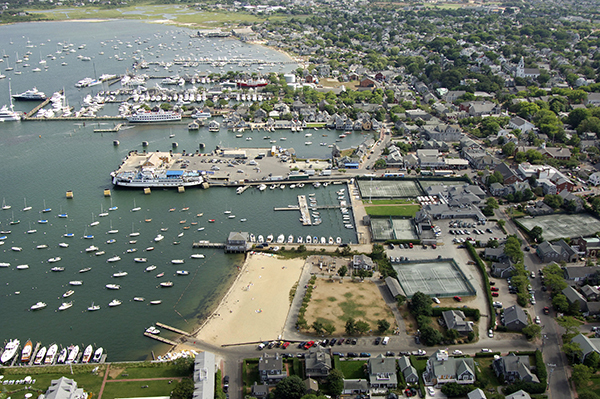 Great news for NRW [Nantucket Race Week] and for EPaint. Second, I’ve been painting bottoms of my boats since 1956 and have used all sorts of products from the old Woolsey hard racing finish of the ’60s to the Pettit products of the last decade. I can tell you categorically that the ZO-HP grey I put on this June (three thin coats, rolled on) is by far the best I’ve ever used for hardness and antifouling effectiveness. In all prior years I would have, by this point in the season, hand cleaned the bottom at least twice and often three times for light slime build up, and some more significant fouling on the sunny side of the mooring. Have not touched it yet and see no evidence of any need to. BTW the light grey color is terrific in telling me how clean it is. Racing record thus far is my best in years. Thanks to you and your team for your support and your product. International racing competitor, Capt. Tom Mullen, races all year round with E-Paint EP-2000 smoothing the way to the winner’s circle. 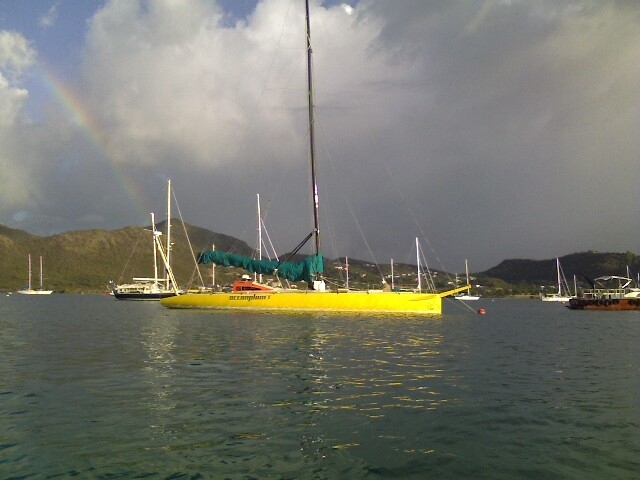 In 2009, competing in regattas around the Caribbean, Shamrock, a J/120, carried her crew and skipper to podium finishes in the BVI Spring Festival, the BVI Spring Regatta, Antigua Sailing Week and the St. Thomas International Rolex Regatta where Shamrock slid around the course faster than any of her competitors to lock up a First In Class trophy. Shamrock’s owner, Tom Mullen, who continues his winning ways by using E-Paint EP-2000 on his J/80 during the summer months on Lake Winnipesaukee in New Hampshire, had this to say about his experiences using E-Paint, “At every Caribbean regatta,” says Mullen, “I see fellow competitors diving on their boats to clean algae and other types of salt water growth off the bottoms of their boats before racing. Nothing, absolutely nothing grows or adheres to Shamrock’s bottom with E-Paint in place,” continued Mullen, “It’s an incredible surface and it’s easy to apply. 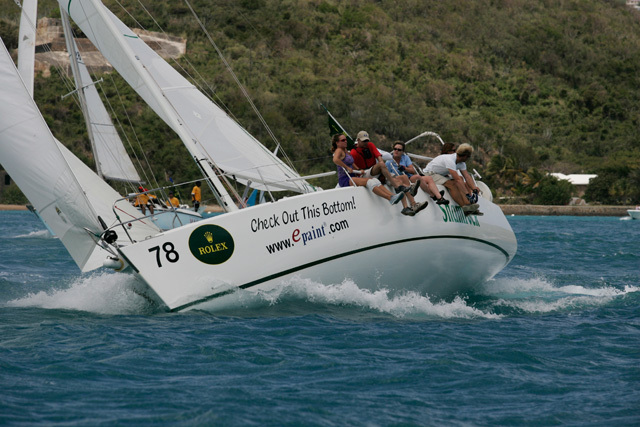 E-Paint is definitely a major contributor to Shamrock’s incredibly successful 2009 Regatta Season.” Mullen invites anyone who wants to hear more about his experiences with E-Paint to contact him by e-mail at tntmullen@owlsnestgolf.com. …we have a couple of very different boats. My wife’s boat is a little 31 foot trailerable catamaran-hulled houseboat that has fiberglass hulls. It was moored in the adjacent slip to “my” aluminum sailboat after both had just had recent bottom jobs…the sailboat with ZO and the houseboat with a well-known copper based ablative paint. They were both launched after painting within a couple of days of each other, as we sometimes keep both in the same marina…we have 3 dogs that go with us, so the little houseboat is great for them while we day sail, or I take the sailboat out and she just “cools out” with the dogs. 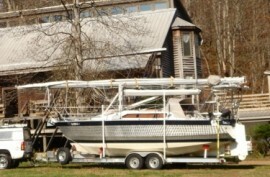 We do take both out, as the houseboat has an outboard, so it does not sit at the dock all the time. We just hauled both for the season to winterize them. They had been in the water at Paris Landing Marina on Kentucky Lake (Tennessee River) for about 3 months and used quite a bit during that time. Upon hauling, I was really astonished by the difference in performance of the bottom paints. The ZO had remained virtually free of the slime and algae build-up that is common in this lake, while the copper-based ablative was definitely worse in the that regard. Even other dock residents kept commenting on how clean my sailboat’s bottom was staying!! When I got the sailboat home on her trailer, it only took a light brushing with some car-wash soap and a spritz with the hose to remove a light brown stain the ZO had picked up. Not so with the houseboat’s hulls, which required pressure washing to remove the algae and slime they were carrying. Needless to say, the houseboat will also be getting ZO for the next bottom job! Here’s a shot of the sailboat BEFORE we cleaned her up…you can see that the bottom is quite clean just as she came out of the water! Thanks for your help and advice…and a truly fine product! In April of 1999 I contacted E Paint with a series of questions, which were answered promptly and to my satisfaction. This was at a time when tin based bottom paints that were inert to both steel and aluminum were being phased out and banned in many countries. E Paint also being inert to both metals seemed to be a logical choice as a replacement provided it offered similar efficient antifouling properties and longevity. My first task was to make an independent test while I had a vessel under construction thus retaining an opportunity to change systems in the event of poor results. After 12 months of immersion it was equal to and in many cases better than the simultaneous test on other anti-fouling paints. It was then that I started to use and recommend your paint for all of my metal hulls then under construction. I also recommended that all of the existing hulls on their next hauling to switch to E-Paint ZO. The latter may sound like an easy task but often it is almost a battle. Some owners are reluctant to prep the hull properly having in the past been just content with a pressure wash prior to painting slap on a thin coat of paint, maybe two coats, and dump her back in the water as quickly as possible after all lay days cost money. This is spending with a shovel and saving with a spoon. Their usual complaint being that the paint is of poor quality. Adhering to my procedures I have had no paint failures, blistering, or major fouling on vessels that are hauled on either an 18 month or 24 month basis depending on their time underway and waters sailed. On existing hulls changing over which have compatible bottom paint. After a complete scrub down to remove any oil, lose paint, and other contaminates three coats of E Paint are applied plus a fourth coat in the upper 18″ to 24″. On new construction four coats plus a fifth in an 18″ to 24″ band at the top. All hulls when hauled there after two full coats plus a third on the upper 18″to 24″.In all cases I have found that the best results are achieved when brush applied. The time between coats is a minimum of 24 hours and also 24 hours prior to launching. No anti-fouling material can be expected to function if it becomes covered with slime, oil, mud, clay, other flotsam, etc. In most instances this occurs in the upper 18″ to 24″ of the bottom and can easily be removed with a light scrubbing. Out of sight is often out of mind thus the bottom is neglected and this will result in shorter intervals between haul outs. My use of E paint spans almost 8 years and I have encountered no problems and always get a live knowledgeable person when I call regarding their product.